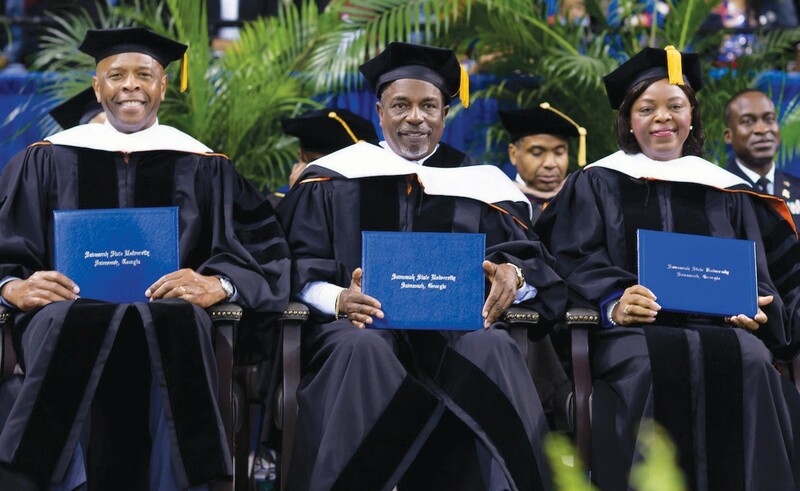 During its commencement on Saturday, December 8, 2018, Savannah State University (SSU) conferred honorary doctoral degrees on three distinguished alumni. Annie B. Andrews ‘83 currently serves as the assistant administrator for Human Resource Management at the Federal Aviation Administration (FAA) where she oversees a strategic partnership between FAA leadership and human resource services for over 45,000 federal personnel across the nation. A retired rear admiral, Andrews is the third African American female to achieve this rank in the United States Navy. Walter E. Gaskin ‘74 is the chief executive officer of La Porte Technology Defense. He retired from the United States Marine Corps in 2013 following a 39-year career that included time as deputy chairman of the NATO Military Committee – a role he assumed in 2010 after becoming just the fourth African-American in Marine Corps history to achieve three-star grade. Gaskin was one of the first four SSU Naval Reserve Officer Training Corps (NROTC) graduates. Will Metts ‘85 is director, Strategy and Program Integration of the Cyber and Intelligence Mission Solutions division for Northrop Grumman’s Mission Systems sector. Metts came to Northrop Grumman following a 30- year career in the United States Navy, retiring with the rank of Rear Admiral. He held a number of key flag officer and operational assignments, most recently as Director for Intelligence, United States Pacific Command.